COLUMBUS, Ohio -- The year is 1965. South is in the state tournament for the first time in more than a decade. Having upset Akron Central in the state semifinals, the undersized Bulldogs went up against highly favored and massive Cincinnati St. Xavier in the state final at St. John Arena. Despite not having a single player over 6-foot-1 and going up against a much bigger Bombers squad led by the tournament's top player Bob Arnzen, South prevailed in the dying seconds. Scrappy guard Roger Harper knocked down two clutch free throws with 45 seconds left to build a three-point lead. With the three-point line still 20-plus years from existence, Arnzen scored on the following possession to trim the Bulldog lead to one, as the Bombers were unable to tie the game with a single shot. South was not rattled, as Lloyd Pate went to the line and drilled two more cold blooded free throws to build the Bulldog lead back to three points. St. Xavier scored once more, but it was all for naught as South used its speed, athleticism and leaping ability to power past a Bombers team expected to roll through the tournament. 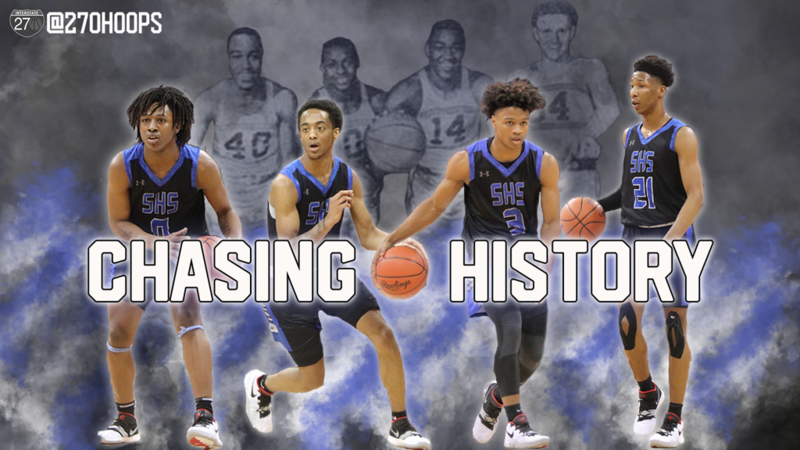 Winning its first and only state title in school history, South did the unthinkable, as coach John Colmery's Bulldogs left a lasting impact that is still felt to this day on the south end streets. 54 years later, those same scrappy Bulldogs from South are back in the state finals against a much bigger, highly favored opponent out of Southwest Ohio in the juggernaut that is Trotwood Madison. If there is one thing you don't do to a South Bulldog, it's count them out. In Robert Grimm's story from the 1965 championship game, Grimm said something that is still relevant to this day. "The wave of upsets proved once again you have to possess more than sheer ability to win Ohio's twin basketball titles," Grimm said. "The clutch-playing, nerveless crews from Columbus South and Northwestern may not have been the best teams in the state but they certainly were the best in the many moments of crisis." Going up against a Trotwood Madison team that enters Saturday's state final averaging 102 points, moments of crisis are what the Rams have created for the 27 hapless opponents that have stood in their way this season. It's the response to such chaos that will determine if Grimm's tale can be rewritten 54 years later. Behind a fearless leader in Ramon Spears, who has prepared every one of those south end kids for this moment, the Bulldogs must enter The Schott with the same confidence that Colmery's outfit invaded St. John Arena with. Senior guard Tre Watkins, much like Harper, is a scrappy senior who has never let size deter what he does on the court. Behind Watkins and its star-studded junior trio of Ta'Quan Simington, Trevell Adams and Marcus Johnson, South has an identity similar to that of its last and lone state title team. After all, the 1965 Bulldogs ended the season at 23-1 with its only loss coming in the City League. For the 2019 Bulldogs, its 28-1 record and lone loss to Walnut Ridge reeks of similarity. Trotwood Madison is the bigger, more athletic version of South, however, the Bulldogs have heart and in March, sometimes that is all you need to make history. In the March 29, 1965 edition of the Lancaster Eagle-Gazette, the headline read "Underdogs' Top Dogs in State Finals." 19,717 days later, South will play to see if the same headline can be used once more.